Zenovia introduces Airhome wireless audio system | What Hi-Fi? Zenovia Electronics claims to have developed the definitive alternative to "boombox in every room" audio solutions with the introduction of a new integrated wireless system for the home. Airhome is being targeted at the premium end of the market, with the system available to buy from Zenovia's online store for renovators, electricians, custom installers and home builders. Logan Jacobs, CEO and co-founder of Zenovia Electronics, said that Airhome is designed as system that neither takes up too much space, nor requires the expertise of a technician. Airhome connects wirelessly to in-ceiling speakers using Apple AirPlay and wi-fi technology, giving you the chance to stream tracks from your Apple device to all rooms of your home. Jacobs said: "We sell high quality music in every room, minus the clutter. We imagined a home where the room literally comes alive with music and we designed a system to do just that. "Airhome enhances and amplifies your life soundtrack very intimately within the walls of your home, never intruding, always responding when you simply press play." The Amp40 "activates" one room of your home and costs $340, while the Amp5.1S delivers 5.1 sound for a home cinema at a cost of $440. The Airhome5 wired hub has a $699 price tag. 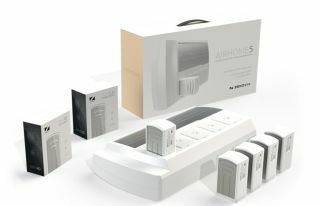 At present, Airhome is engineered and certified for the North American market alone and not available to UK customers. But the company has confirmed it is "working on certificiations for additional global markets".